Abstract: Rice husk is a by-product of rice milling process and abundantly available waste material in all rice producing countries. Upon calcination, rice husk produced of about 20% ash of which 90% was silica. Acid treatment of rice husk prior to calcination was proved to be very effective in producing silica with high purity. In this experiment, rice husk was treated using hydrochloric acid and citric acid for the metal impurities removal. Thermal treatment was conducted at 750oC and maintained for 5 hours. Silica was mostly deposited on the epidermal layer and showed similarity with the intact structure of rice husk based on SEM investigation. The resulted silica was proved to be amorphous according to FTIR (Fourier Transform Infrared Spectroscopy) and XRD (X-Ray Diffraction) analysis. The BET (Brunauer-Emmett-Teller) specific surface areas of silica derived from calcined hydrochloric acid treated and citric acid treated rice husks were about 312 and 255 m2/g, respectively. Silica with purity of about 99% was obtained in all calcined acid-leached rice husks based on XRF (X-ray Fluorescence) analysis. Citric acid treatment was less harmful and less corrosive as compared to hydrochloric acid and was still effective enough in producing high-grade silica with high purity and high surface area. 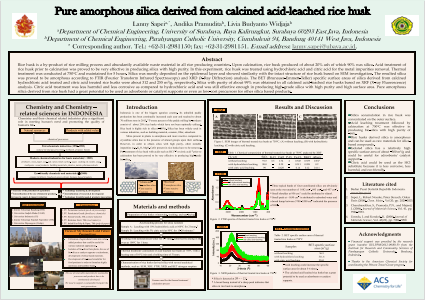 Pure amorphous silica derived from rice husk had a great potential to be used as adsorbents or catalyst supports or even as low-cost precursors for other silica based products. Research reported in this publication was supported by grant number III/LPPM/2012-09/80-P from the Institute for Research and Community Services of Parahyangan Catholic University, Bandung, Indonesia.Summary: Pure amorphous silica was isolated from rice husk after acid leaching process with hydrochloric acid or citric acid followed by the thermal treatment at 550oC. Silica was characterized using various techniques, such as XRF, FTIR, SEM, BET, and XRD.References: 1. Badan Pusat Statistik Republik Indonesia. Paris (2008), Chem. Mater., Vol 20, pp. 2020-2025. J. (2006), Journal of Materials Science, Vol. 41, pp.